On Sunday I finally got around to modifying one of my Etherkit Si5351a boards to use my Leo Bodnar GPSDO by replacing the 25 MHz TCXO. 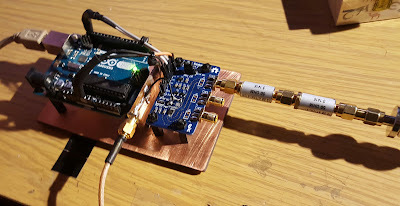 I just used a bit of scrap copper-clad PCB and an edge mount female SMA connector and a short bit of high quality coax (about 1 inch) to jump from the connector to the input where the TCXO was mounted. The result was a super stable output from the Etherkit Si5351a without any further modification. It's been my experience on two different Etherkit boards that the TCXO is fairly drifty even with mild temp changes. In addition for some reason it sometimes 'jumps' about 10-20 Hz randomly (too frequently for my taste often multiple times in 30 seconds) which makes for some wonky resultant CW (Morse code).